Another very nice Sunday and another good ride planned by the Feilding Riders so all I had to do was turn up. I gassed up at Ashhurst and pottered out to the Waterford Cafe to wait for the rest of the guys who were coming from Ashhurst, Palmy & Feilding. They arrived in a bunch not long after I had parked up and I managed to snap a couple of pics of them turning up. From the Waterford we headed out Pohangina Valley East to our first stop in Apiti. Had a great ride through here and the road is in very good condition for this time of the year. From Apiti we continued on to Pemberton and this bit was fantastic - the roads are never straight for long and always a hoot. From Pemberton we turned towards Ohingaiti - another nice bit of road but one which does deserve a bit of caution as there is quite often metal on some of the corners or stock out on the road. Unfortunately this proved to be the case today and one of the 3 Alistairs on the ride came to grief on his Bandit. I'm not really sure of what happened as we didn't find out until KiwiKat caught up to us at Ohingaiti. Apparently he is ok, walking around but with a few sore ribs so an ambulance was called to pick him up. Hopefully nothing serious at all - for him and his bike. Not good. First up, it's a very tall bike - the seat height would be quite a bit higher than either of my bikes. But once you are aboard the bike is very roomy and comfortable. Really like the wide bars and seating position - it reminds me of a Bandit (but the bars are even wider) or even Dad's old 1150GS. The dash has got everything on it that you really need: analogue tacho with LCD for velocity and other information. The bike has also got brush guards on the bars for a bit more weather protection as well as Oxford hot grips which I didn't really need today. Starting the bike up I got my first inkling of how silent and smooth the engine is - it was only the tiniest bit of vibration coming from the motor and an operating rev counter that told me she was purring into life. Taking off down the road only reinforced this impression - the bike is silent and just oozes smoothness. As I was getting to know the bike I had to keep an eye on the rev counter to know when to change gear - you don't really get a signal from the motor, it's that smooth. Trundling along behind Flynn on his 250 I got used to the riding position very quickly. Bike's set up like this (like the Connie, Bandits and bikes of a similar style) just feel right. Everything is where it should be and it makes the riding of them so easy - not a problem to ride all day long on and far more comfortable than more sports orientated stuff. Coming into Bulls I got my first inkling into how good the anchors were - you just brush the front brake lever and you're slowing up. Grabbing a handful would not be a good idea. Later on out on some back roads I got the chance to get along a bit (trying to keep the VTR in sight) and the bike felt great. The motor continues to purr and feel effortless even with a few more revs on the dial. As the roads were wet in places and unfamiliar to me I didn't get to throw her around that much but I've certainly seen Al do just that as he romps away from me so I have no doubt that the bike can handle and handle well. Overall impression? A lovely bike with a turbine of an engine - definitely different to my twin and my four. I felt that you don't get the torque hit like on either of my bikes but the torque is there just the same, it's just hitting a lot smoother - crank the throttle and it just goes. Handling wise and comfort wise - well it's just about perfect for doing some distance on. Right, so this tag hunting thing is getting a bit serious. Yesterday afternoon I went out after one which I was only partially sure of and ended up missing it but ended up having a great little ride on some back roads anyway. Meanwhile, Flynn had worked out where he thought the tag was and wanted to grab it as part of the planned Sunday ride around Pohangina. Six of us met up at Ashhurst and after looking at the weather and feeling some of it on our faces we decided to cancel the Apiti Loop and head off after the tag. We made our way to Bulls via Colyton, Feilding and Halcombe and then headed for coast (Tangimoana) and where Flynn thought the tag was. After a nice pootle in the countryside (some of it astride a Tigger) and plenty of looking we decided to head back into Bulls for some lunch before attacking the problem again. After lunch we popped into the Information Centre at Bulls and the lady there let us commandeer her computer and we discovered that the tag had been found and a new one posted. Approx 250km ridden today in search of the elusive tags...great fun! Went out last night and managed to pick up my second tag - out on Pohangina Valley East Road. It was pretty dark out there I can tell ya! The new bulbs in the Connie were great though and it was quite a mild night out so a good bike of after work fun. Starting to get a bit addictive this tag chasing... Tagorama Website here. 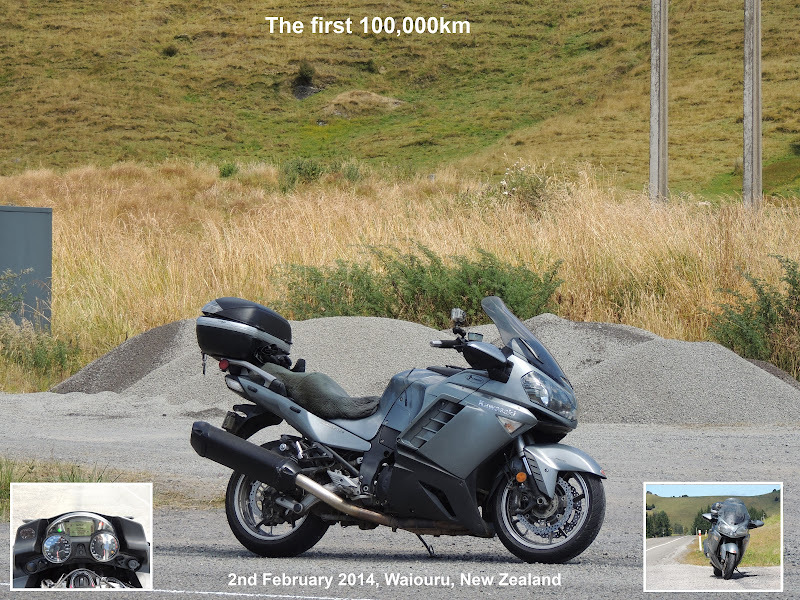 For a bit of the fun the local Kiwibikers are playing a game of Tagorama where one person takes a photo of their bike somewhere, then the race is on for someone else to find it, take a photo of their bike there and then at another location. Only been going for a few days now but could be a lot of fun - got my first tag tonight. Another absolutely stunning winter's day with very calm and sunny conditions all over the country so no excuse not to get the bike out of the shed. Brian and Pete were keen too so at 9am we saddled up and hit the road. 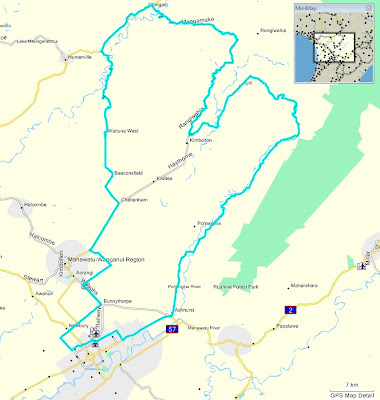 Brian and I had kicked a few ideas around and in the end decided to do the same route through to Martinborough that I'd done with the Fielding Riders a couple of months ago (blog here). First up, the Pahiatua track and into Pahiatua for gas before hitting the back roads. It was still pretty chilly out and there were plenty of damp spots in places that needed to be shown some respect but the ride down from Pahiatua to Alfredton was great. Heading South on Route 52 from Alfredton there were quite a few frosty bits but also plenty of nice and dry sweepers to enjoy. I'm not very familiar with the back roads through to Martinborough (so can't remember any names or anything) but these roads are a really nice mix of sweeping bends, some straights and some really tight stuff - all through very picturesque scenery. Biking nirvana. We managed to go past the place where Gerble died without either of the Honda's (or the Suzuki) dying but not long after all three of us had a wee moment on a very slippery corner (the sign was correct) before idling into Martinborough for a spot of lunch. From Martinborough we pootled into Masterton and topped up our tanks and then followed Brian out of town and turned off to go through to Mauriceville. Once again, some really nice back roads through here and more great scenery. The last bit of ride involved a little bit of State Highway (pffft) and a good blast through Managamire and over the track. An absolutely stunning day out - all winter's days should be this good! A little video of last Saturday's ride to Wellington courtesy of Cowboyz' helmet cam. We've had two great days of weather but unfortunately they both have happened to fall during the working week which makes it a little hard to get in a decent ride...back and forth to work is just not enough. It was a great run through the Hill in the gathering darkness and hopefully Cowboyz got some video for later. A nice burger in Hunterville and we were off again heading South on SH1. Talk about cops! In one 10km stretch there were two of them busy writing tickets. Not a very nice start to the day - woken early by pouring rain on the roof, the day not looking very biker friendly. But I had two bikes needing warrants and one needing rego ($$$) so I got up early and Mark and I took the Connie & the Honda down to get checked out. Luckily both passed ok and I rode off with a lighter wallet but two legal bikes. We stopped in to catch up with Meanie and I had my arm twisted on a ride down to Wellington to check out one of the bike ships in Lower Hutt. After parking the VTR in the shed and shooing Mark off I got suited up for wet weather just in time for Meanie, Monie & Cowboyz to arrive to pick me up. In Shannon we met up with Al and headed off into some light showers, our next stop was Waikanae where we were joined by Ezirider on his SV and then onwards to Paraparam where Meanie topped up his tank. From here we headed up over Paekok Hill which is a great ride in good conditions, although today we had to take care on wet and greasy roads - still a fun ride. Then it was a little squirt over Haywoods and into the Hutt where we parked up and spent some time looking at bikes and accessories. It was good to catch up a guy (Dave) who used to work in a bike shop in town and now is a rep for Alpinestars. He had plenty of info on some of their latest road gear and was intersting to talk to. Turning around we headed back over Haywoods and then popped in to have a coffe with Cowboyz' brother in Titahi Bay before once again tackling Paekok Hill as we headed home. This time around the roads were a lot dryer and the Hill road a lot fun - Cowboys will hopefully have some video of this up soon. A couple more quick stops for fuel and coffee and a quiet pootle home and that was the ride done. A great day out.